A selected file, or a group of files, can be dragged with the mouse (Drag and Drop) into other programs that accept the file list. If a selected file is dragged, then all selected files will be dragged to the same destination. Or, the default action is set to the standard “drag the image in the window” but the current zoom is such that the image fits within the window completely. Drag-and-Dropping happens in copy mode, so files don’t disappear from the program window. 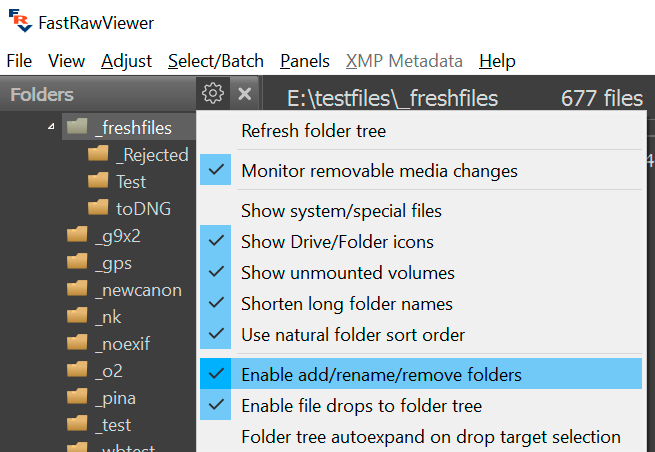 Files can be dragged within FastRawViewer itself to file trees; with default settings, this mode is turned on (it can be turned off by unchecking Enable file drops to folder tree in the settings of the Folders panel). In the same Folders panel settings, one can turn on Folder tree autoexpand on drop target selection – in this case, folders will automatically open upon dragging a cursor with files “attached” to it. The folder that is currently under the drop cursor is automatically highlighted in red. Move files – the files will be moved and the request for confirmation is set by the Confirm file move checkbox in the same Copy/Move/Reject pane).